Caption slip reads: "Date: 1960-01-09. Reporter: Fauman. Assignment: 'Unusual jobs' -- Scattergood steam plant. F-7/8: Albert H. Schaefer, steam plant operator, at #1 control panel -- note 2 closed circuit TV screen in front of Schaefer showing TV relay into furnace's bowels. 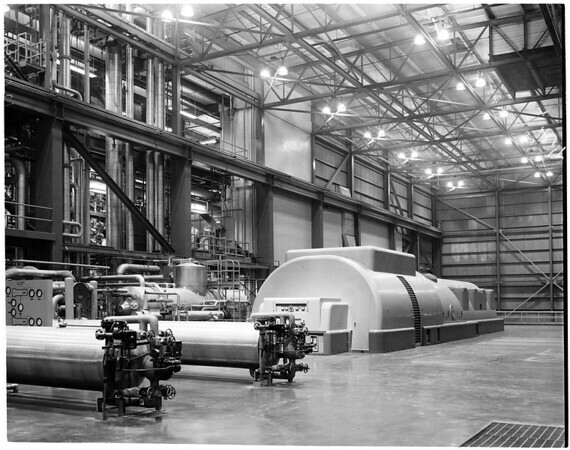 F-1/2: Interior shot of Scattergood steam plant shows huge round-domed electric generator in mid-ground".